The most Japanese of the national sports, the ancient art of sumo wrestling is part ritual, part ceremony, and all pure excitement. The short bouts make sumo a surprisingly accessible sport, and the rules of the game are essentially simple: the famously large wrestlers, or rikishi, position themselves on either side of the raised clay platform, or dohyo, and scatter handfuls of salt into the ring – an ancient ritual of purification that dramatically reflects the mood of the combatants. The opponents then crouch down and size each other up, carefully choosing the best moment to launch their assault. Once it begins, the action is dramatic and usually over in just a few seconds. Whoever is thrown or pushed out of the ring or hits the ground with any part of the body except feet is declared the loser. Though the wrestlers weigh in at over three hundred pounds, they follow a special programme of exercise to strengthen the back, leg and stomach muscles, and are surprisingly agile. Traditionally only allowing Japanese wrestlers, sumo is gradually opening up to non-Japanese, and Hawaiian, Georgian, Bulgarian, and Samoan wrestlers have ranked highly in the sport, with the Mongolians Asashoryu and Hakuho both currently holding the highest sumo title of yokozuna. Six grand sumo tournaments, or basho, are held annually. A two week long tournament is held in Fukuoka in November each year. 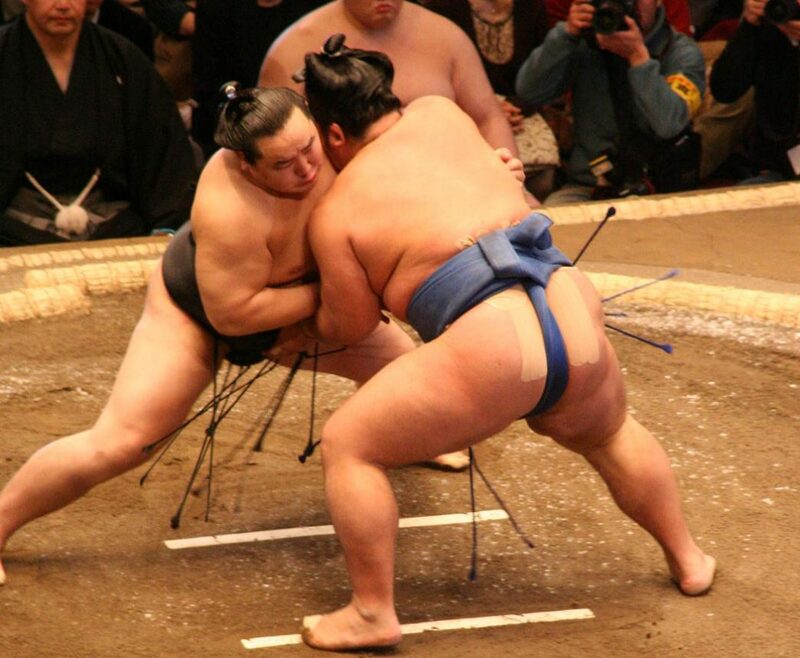 Into Japan is happy to arrange sumo tickets during these tournaments as part of your tailor made tour to Japan.